If you haven’t heard about the great sombrero kerfuffle of 2015 then let me fill you in. Last week newspapers across the country carried the story that the student union of UEA had banned a local Tex Mex restaurant from handing out sombreros. This has led to accusations of ‘political correctness gone mad’, and a lot of general smugness from middle aged journalists and their readers. How and why this story has blown up so much is a mystery, but it probably won’t come as much of surprise when I say that this is the epitome of mountains being made from mole hills – and I’m not talking about the union’s decision. Last week, during the Freshers’ Fair in the LCR, Pedro’s (the restaurant in question) was handing out sombreros to new students as part of its advertising. When Union Officers found out they asked the stallholders to stop, citing their advertising policy which the restaurant had been informed of before the event. The Union Officers felt that the free sombreros were not in line with their blanket ban on, “Discriminatory or stereotypical language or images aimed towards any group or individual”. Sombreros fall pretty squarely into the ‘stereotypical images’ box. I think it is quite reasonable to disagree with the Union’s belief that people not of Mexican descent wearing sombreros is offensive, but the amount of outrage levelled against the Union is extraordinary. The union’s facebook page was covered in comments from people criticising the officers’ decision, one memorable comment said, ‘I don’t understand why we’re in the top three for student satisfaction when the union does things like this’, (admittedly I have turned down the language). The ability to wear a sombrero around campus has never been central to my enjoyment of the student experience, but each to their own. Rules like these exist to prevent racism and cultural appropriation – in short, to make UEA a welcoming and safe space for all its students. Can the Union Officers make mistakes? Yes. Might they have misjudged this situation? Yes, but I would rather we have a dozen ‘#somberogates’ than one student be made to feel uncomfortable or unwelcome because of their ethnicity. At the end of the day, Pedro’s is probably enjoying far greater footfall than usual thanks to the coverage, and the Union has said that it will review its policies – so has anyone really lost out? Like I said, mountains out of molehills. I was forewarned that university holidays were long, but I’m only just beginning to realise quite how long they are. I’ve been home for two weeks now and already Netflix has lost its appeal. I’ve promised myself that I will get through the ever growing pile of books by my bed but my current read, ‘Iceland’s Bell’ by Halldor Laxness, just doesn’t appeal when the sun is blazing away outside. The task, then, is to find ‘constructive things to do’ as my mother would say. This week I have managed to assuage the guilt of not finding a proper job this summer by volunteering at the Chalke Valley History Festival. 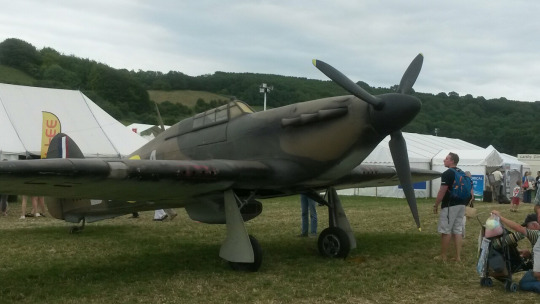 CVHF is an annual festival which takes place, surprise surprise, in the Chalke Valley area of Wiltshire. It’s the largest festival in the UK dedicated to just history and is therefore a nerd like myself’s dream day out. Despite having lived nearby for a long time this was my first visit to the event, and I’ll cut to the chase by saying I loved every minute of it. 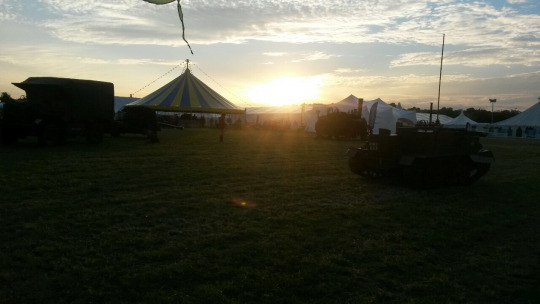 As a volunteer I had free entry to the site and was able to wander around early in the mornings watching the re-enactment camps slowly come to life. The Tudor royals lounged in the sun whilst hassled looking faux servants scuttled around preparing for the lunch time feast, and roman soldiers chatted to Dark Age peasants whilst a Georgian woman walked around in her nightgown. I was also lucky to see around half a dozen amazing talks by acclaimed historians, ranging in topics from the untold stories of the non-white, non-european participants of the first world war, to debates about the importance of Magna Carta… maybe not everyone’s cup of tea, but I thoroughly enjoyed it. Events like these are a great way of adding something to your CV, especially as we now live in a world where every job wants prior experience. There were volunteers who had just finished their GCSE’s and there were volunteers who had just become grandparents – basically, anyone with a love of history was welcome. My only gripe with the festival was just how stereotypically Wiltshire it was (by which I mean how very Salisbury). Most of it took place during week days, which of course isn’t the organisers fault, but with events starting at half five in the evening in a location in the middle of nowhere, only a certain demographic is able to attend. What I’m trying to get at is, that it was very white middle to upper class. A sea of multi-coloured corduroy trousers filled the valley and someone was heard using the term, ‘spiffing’. Now the local demographic isn’t something the organisers can do much about, but what does need to be changed is the lack of diversity amongst the speakers. I saw only one talk by a historian who wasn’t white, and a panel discussing the importance of Magna Carta in the development of liberty and human rights was entirely composed of white men. Obviously this isn’t meant to be construed as an attack on white men, although undoubtedly some will interpret it that way, but we do need to actively be making space for and promoting voices beyond the traditional white Anglo-Saxon narratives that we usually hear in history. 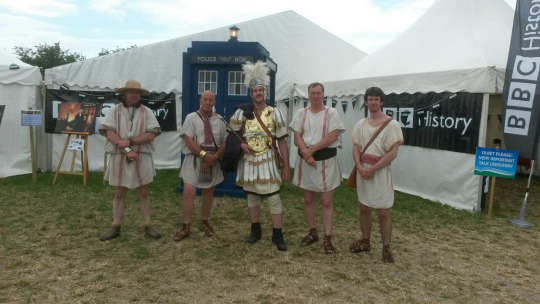 On a lighter note, here’s some Romans with the Tardis.